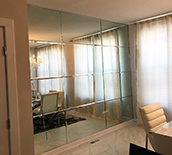 At Reston Glass, we offer a huge assortment of wall mirrors, floor and vanity bathroom mirror designs and decorative mirrors in a wide range of styles. 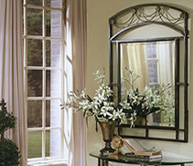 We have decorative beveled wall mirrors in many styles, sizes, shapes and colors with ornate solid wood frames. Find a mirror to add sparkle to your décor, add depth and light to small room spaces, or add glamour to a bathroom. Whatever your style, you’ll find it all right here! A beautiful mirror can lend character and charm to your bedroom or foyer; it can also add a personal touch to a basic bathroom. 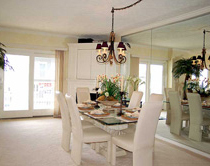 Keep things in proportion when decorating with wall mirrors. Try to accentuate tall or open spaces with pieces that match the scope. Don't fill large wall spaces with several small pieces; you may fill the space, but you will likely lose balance and create a cluttered look. Instead, choose one or two dramatic items that match the proportion of the room. Wall mirrors come in a variety of shapes and sizes to open worlds of design possibilities. 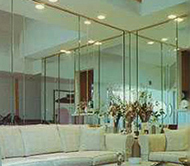 Circular mirrors create a soothing sense of flow, while rectangular mirrors have a stronger, more noticeable presence. Try positioning wall mirrors so they reflect something that is pleasing to the eye such as soft candle light, a silk floral or framed artwork. This will add light, depth, and visual appeal to your living space. Many wall mirrors are themselves works of art. These pieces won’t just reflect the decor of a room; they will reflect something of your personality as well. Consider the size of each mirror as you shop. 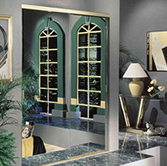 Some wall mirrors have richly detailed frames outside the mirror glass. Measure before you buy and be sure you have adequate space. This way you can appreciate your purchase as you imagined it. Whatever shape or style you choose our wall mirrors promise to add welcoming light and depth to any setting. Our expert staff will come to your home or business to determine the exact measurements needed for the space you want mirrored. Don't let our name confuse you; we service all of Northern Virginia including Pleasant Valley, South Riding, Manassas, Fairfax Station, Westfields, Annandale, Dominion Valley and more.